Sadly updates to this article have somehow been deleted or lost and I have to do it all again!!!! Why I can't say. Whenever these mass shootings occur, I feel a combined sense of deja vous and ambivalence. Deja vous because claimed mass shootings have almost become common-place in American society. This latest one is reckoned to be the 13th of its kind and the most serious since Sandy Hook on December 14th 2012 - namely five years two months prior. Of course hardly mentioned is the fact that this merely the tip of the iceberg as regards gun deaths generally, for which the statistics are truly horrifying. Ambivalence because of the the very stylised, scripted treatment of the event, often with very dubious conflicting elements, making it hard to distinguish between fact and fiction, whilst at the same time wishing to empathise with those that have genuinely lost loved ones or undergone serious trauma. Whilst projecting shock and disgust, one cannot help think that the news media en masse almost delight when they occur and present them as sensationalist events. It is also interesting how they become top news items across the world, as if there is some unwritten agreement on what constitutes "news", presumably the number of deaths and the fact that the victims are children. Nevertheless we should always question this prioritisation process that subliminally tell us what are important events and what are not. For example only one week before over 100 Syrian combatants - also young and precious to someone - were killed by American forces, illegally present at a base in eastern Syria, but what did we hear about that? Not only was it not a leading news story, it was hardly reported at all! It is a sad reflection on our times, that we can no longer assume that what we are being told by Government and its agencies, can be automatically relied upon. Indeed we must now question everything for interior and exterior consistency. Government and media read from a script that they suggest is the only valid version and that those who disagree should be labelled as "Conspiracy Theorist" or essentially unbalenced mentally. Given recent experience, I would argue that you would have to be lacking intellectually not to question the official narrative of such events. The Las Vegas shooting is only the most recent example of Government incompetence and falsehood. Such was the misrepresentation, we can only suspect elements of Government were directly involved both in causation and cover up! Since 9/11 (some would argue it dates from the assassination of President Kennedy) the fundamental trust between Government and Governed has been shattered and subsequent "terrorist events" have often confirmed it. Effectively only the Internet has challenged this state of affairs and It is no accident that Government is now seeking greater control over it. In the case of this latest outrage in Florida, if such it is, the usual question applies. Did the events unfold as the official narrative describes? So what is it? 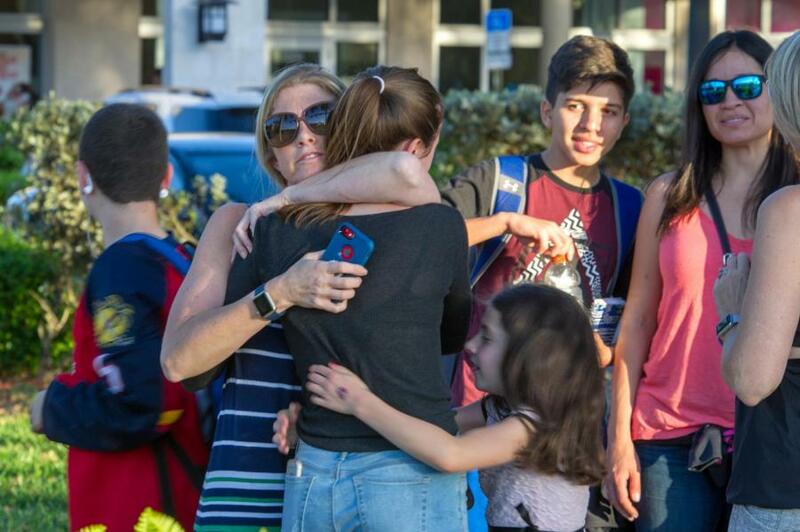 In summary it is that on Valentine's Day, February 14th 2018, at the Marjory Stoneman Douglas High School in Parkland, Florida, at approximately 2.40 pm, just as students were about to leave, an expelled 19 year old ex-student, Nikolas Cruz, started shooting with an automatic weapon inside the building, killing 17 and injuring many more. He then dropped his weapon and back pack containing ammunition, and calmly left the building apparently engaged in conversation with other students. He then walked about a mile to a Walmart store and then to a MacDonalds, before he was non violently arrested by police, hand cuffed and driven by ambulance to the local hospital because he was "suffering from breathing difficulties". He has subsequently admitted to all of the murders and other offences. On the face of it, good-looking Cruz hasn't had a particularly hard life though he has had something of a troubled one. Adopted, his adoptive father died when he was comparitively young and his adoptive mother only three months prior to the attack apparently from influenza. He had been expelled and banned from the Parklands School over his girlfriend but he could not have been dim, as the Junior Reserve Officers' Training Corps (JROTC), had awarded him multiple times for outstanding academic performance, it it reported. It seems he had an obsession with guns and his on line tweets contained suggestions he had homicidal tendancies for which he had been reported to the FBI who took little substantive action by all accounts. There is also some suggestion of mental disturbance for which he sought help. So what should we make of all this. Does it support the notion of a lone cold blooded killer? It may do though it is very hard to comprehend. However it also neatly fits with a more sinister profile of the 'Manchurian Candidate' or 'Patsy'. Is it possible that either he was 'brainwashed' to carry out an operation or alternatively to accept the blame for something actually carried out by someone else? Given all we know regarding CIA involvement with MKUltra and actual events, neither of these possibilities can be ruled out. We know such 'tricks' have and applied. We know the security services like to have people with minimum family connections which raises a question mark about what we must assume was his mother's premature death. It is not clear how long he was associated with JROTC but on the face of it it would appear he was identified as a high flyer with potential. Nor do we know under what circumstances he was referred to professional psycholical help or what it consisted of, but all of these could be relevant. What I find strange is that despite it being known he had an obsession with firearms and making threats, this was never taken seriously by police or FBI, even in this current climate of mass shootings and terrorist events? No one went to see him to assess his mental state and motivation, or to dissuade him, or prevent him from holding so many powerful weapons. This I find quite extraordinary to the point of incompetence. What does all the surveillance and predictive personality profiling amount to if even the reported likely cases are ignored? Why are ever more powers and resources demanded when the existing ones are unused? Past similar cases point to collusion between the agent and agency with aim of a covert operation that can realistically be blamed on people and factors other that the real ones. So returning to the incident and how it unfolded, questions must be asked as to how he arrived at the scene and entered the building? Apparently he arrived by Uber Taxi! Did the taxi driver not think it strange that a young man should ask to be driven to a school with a high-powered auto matic weapon plus heavy back pack? Did he/she not think it might be wise to report same to police or at least their control? Taxi drivers are pretty smart at assessing people - they meet a lot of them. Was there nothing in the conversation or behaviour of Cruz to indicate his evil intent. Would there not be evidence of the physiological effects of adrenalin exibited even by highly trained soldiers before an operation - restlessness, nervousness, sweating etc? One would have thought we might have heard from the Uber driver but as far as I am aware he has been absent from the TV screens and interview rooms. Then we have the question of how Cruz got into the school. We are told he was banned and staff had been instructed not to let him in yet he seems to have gained entrance easily without being challenged. "Don't let him in with a back pack" which immediately strikes me as even stranger. Either that has been contrived for effect or it indicates the headmaster was worried what might be carried in it - other than books. But this was a high-lighted lad not only carrying the banned back pack - apparently full of ammunition - but also a highly dangerous automatic weapon that could not be hidden! Yet no one challenged him or tried to prevent him entering? The school claim is that it is very security conscious, that it specifically trained for attacks of this sort. Was the exterior door not at least locked then to prevent unauthorised entry? Or if open, was there no security personnel or staffing at that point? Or if both aspects were adequately covered - surely the most basic of security measures - then how did he get in holding a large high powered weapon? This is very hard to explain. Then no doubt, being "very security conscious" in this day and age, the premises must surely be covered by CCTV that would quickly answer the above question and many others, certainly I haven't seen any footage from that source, nor have I heard any interviewer ask the question. We are all familiar with the fact that a uniform feature of fraudulent events is the absence or failure of CCTV. Surely that cannot be the case here? What mass killer puts his gun and ammunition down after shooting lots of people at point blank range and then saunters out of the building chatting to girl who knew him well. She notices nothing untoward about his behaviour. What no nervousness, no sweat, no blood? And where did he leave the items? This crucial detail has not been mentioned. Then the same girl claims to have heard shots continuing whilst she was walking out with Cruz. Another claims there were at least THREE shooters. As with Las Vegas more than one shooter, if true, blows a gigantic hole through the official story. Then we have lots of shots of students filing out the building with their hands up or holding on to the person in front. This has become a recent and common theme across the west. Some might consider it an indicator of fraud. Others that that it is merely intended for psychological purposes, as it suggests blaming and humilitating the victims. Whatever pseudo security purpose propounded for it clearly didn't work in this case as the alleged perpatrator walked out, as he had walked in, unmolested and unchallenged. Nor is it clear was there any attempt to identify and debrief those that had left, surely a primary objective to establish what really happened. This all appears, as in other such events, to be suspiciously intended just to give the appearance of thoroughness and for its emotional impact, with little or no security purpose. 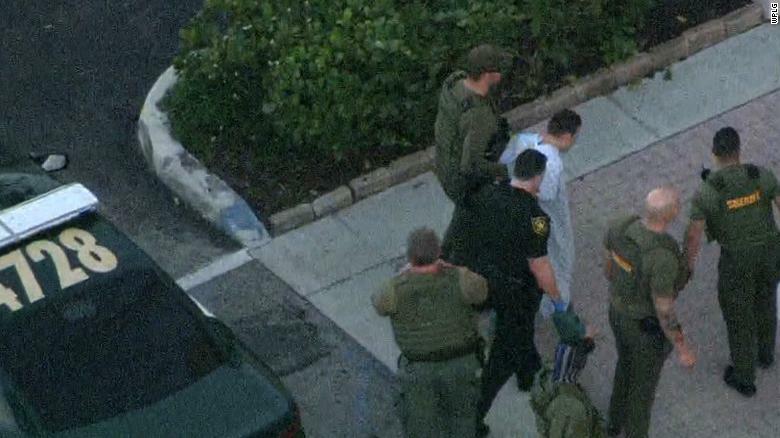 Cruz is located about an hour later after he has walked to a MacDonalds about a mile away. (Alarm bells ring when yet again that franchise gets a mention in a terror event!) I suppose that is what one does after killing 17 people with automatic fire! But it also raises the question of how and why he was identified and located. From what source was his name put forward? How was he located and arrested without a struggle? If passive why didn't he give himself up. If aggressive and determined why not fight? If determined to escape, why not plan for it and do it with a will. Overall this appears to suggest confusion or innocence or even some hypnotic or drug induced state. Being taken to hospital in an ambulance just compounds the mystery. The photographs appear conflicting (see below) and how often do armed police convey a confirmed and uninjured mass shooter to hospital in an ambulance? Only recently an American cop was sacked and later awarded huge compensation payment for not shooting a man with a gun, subsequently shot dead by his colleagues. Yea I had the same impression. Most unconvincing after such a trauma. This is not how people behave after major shock. Either these interviewees are untypical or they didn't experience what they said they did. There are so many more coincidences and anomalies (as per previous events) they all start to stack up. "Safest town in Florida; Valentine's Day; contemporanious emergency drill including "mock gun shots"; student's (not generally aired of course) sure there was more than one shooter; student reports walking out with Cruz whilst shots still happening;if this is true what did he do with weapon and ammunition? ; is that how an immature mad gunman behaves? ; how did he get in if he was banned and not a student there? ; how did three die outside? ; the way he was identified and handled by police if he was unarmed at the time; and carried off in ambulance???? Reported 17 died AND 17 admitted to hospital??? First picture of hugging women appears completely contrived as she has a black cross on her forehead whilst those around appear bemused. Another of alleged attacker with Trump slogan on his head. The whole gun debate thing esp. in Florida. Cruz fitting the alienated student with mental problems and a convincing back story. "Israel - actually the police chief - says." The obligatory hero meme. etc etc. We shall have to see. 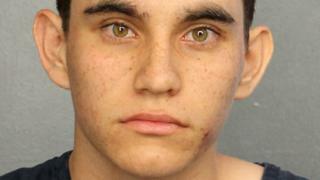 "Nineteen-year-old Nikolas Cruz has been identified as the suspect in the shooting that killed at least 17 people at the Marjory Stoneman Douglas High School in Parkland, Florida on Wednesday. 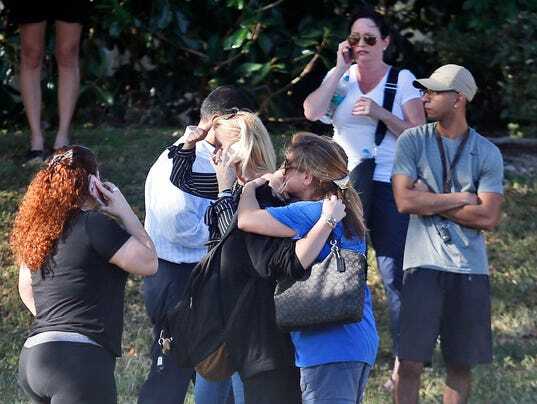 "Cruz was reportedly armed with an AR-15-styled semiautomatic rifle and "countless magazines," the Broward Sheriff's Office said. Law enforcement officials familiar with the shooting said Cruz also possessed a gas mask and smoke grenades, Sen. Bill Nelson of Florida said on CNN. 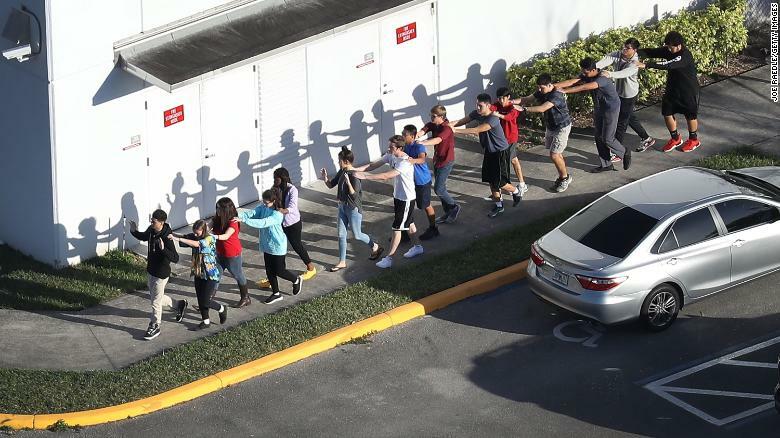 "Cruz was believed to have intentionally set off the school's fire alarms "so the kids would come pouring out of the classrooms into the hall," during the shooting, Nelson continued. 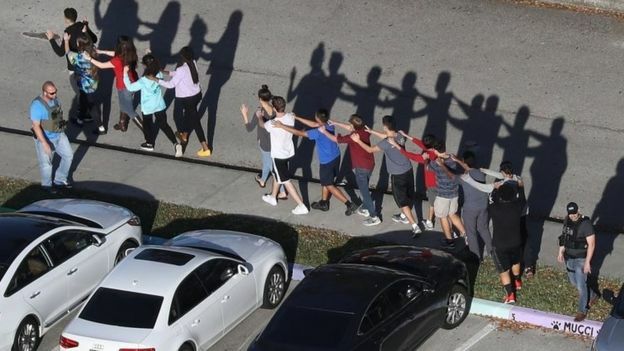 "Following the height of the shooting, Cruz reportedly tried to escape by blending in with other fleeing students, law enforcement sources and eyewitnesses told ABC News. Though he managed to leave the school, he was later apprehended after the police identified him through surveillance videos, CNN correspondent Martin Savidge reported. "Cruz, who was detained without incident and was transported to the hospital for labored breathing, has been the only suspect named in the shooting, according to Savidge." Evening Standard: "Terrifying: One of the images posted to an Instagram account believed to belong to Nikolas Cruz"
In several Instagram accounts believed to belong to him, he is seen posing with a selection of knives and guns, showing off about his weapons. 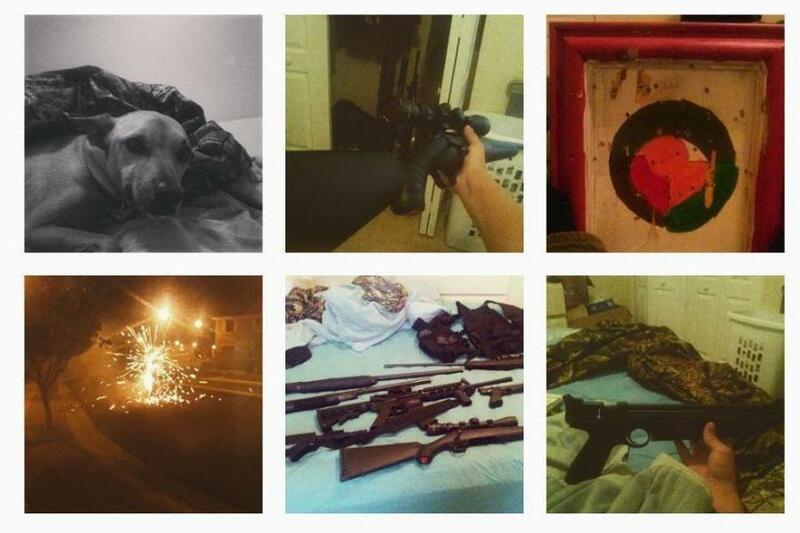 Other posts show a terrifying arsenal of weapons laid out on a bed, as well as captions mocking Islam. 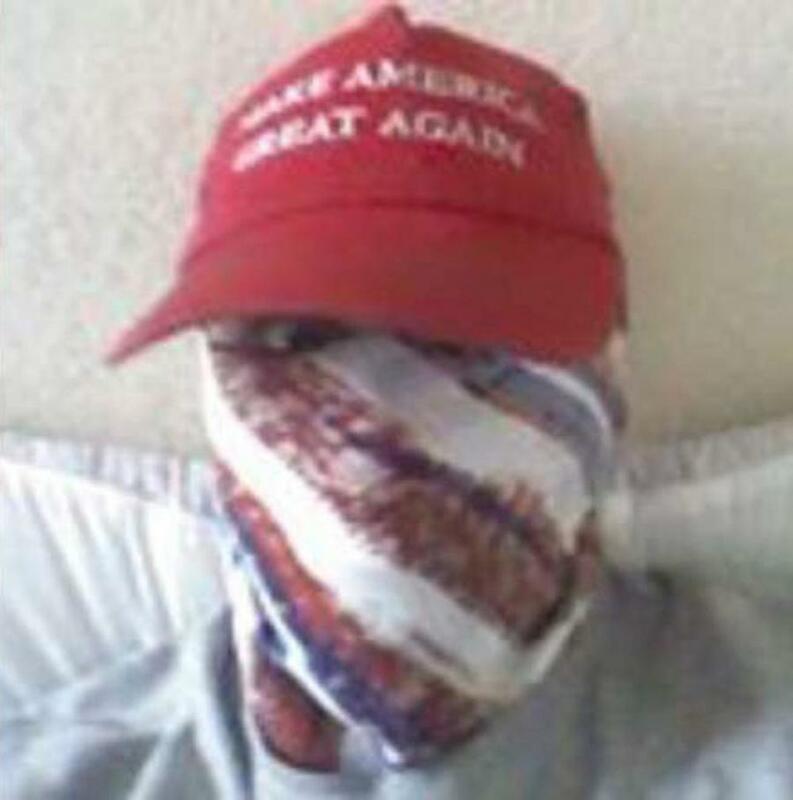 Evening Standard: "Other images taken from an Instagram account purportedly belonging to Cruz"
Evening Standard: "An account reported to have belonged to him bears this profile picture of a masked man in a ‘Make America Great Again’ baseball cap"
Broward County Mayor Beam Furr told CNN that the shooter was getting treatment at a mental health clinic for a while, but that he hadn't been back to the clinic for more than a year. 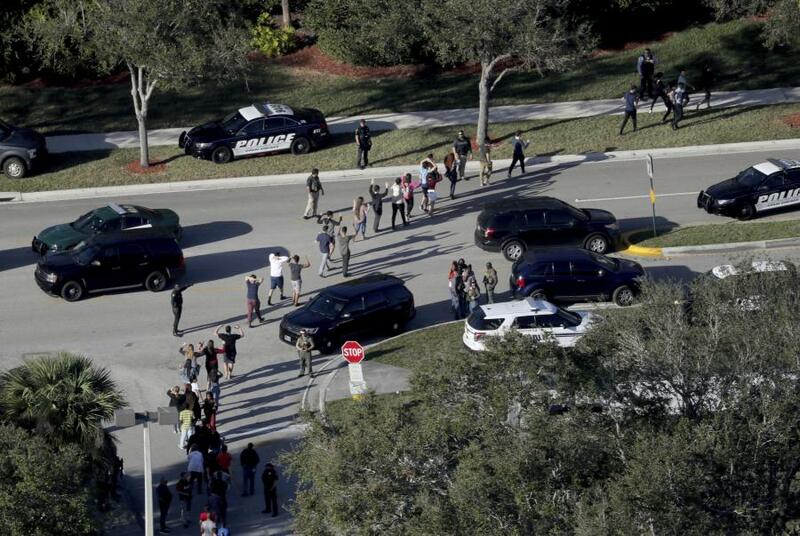 Evening Standard: "People are led away from the scene of the mass shooting in Florida (AP)"
Law enforcement agents transport the suspect in Wednesday's school shooting. According to a law enforcement source, the suspect initially mixed in with the crowd of students to try to get away, but it didn't work. * 'St Valentine's Day Massacre' applied to event in Chicago on the 14th February, 1929, when seven men were murdered by the organization led by Al Capone to eliminate George "Bugs" Moran, the boss of the long-established North Side Gang. 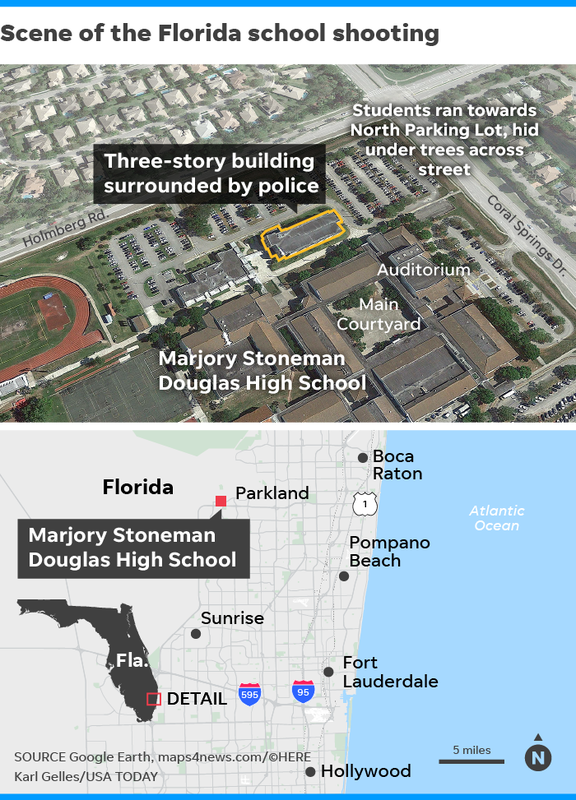 It is still too early to tell what really happened at Marjory Stoneman Douglas High School in Parkland, Florida on Wednesday 14th February but this video news clip suggests that there was a "shooter", other than Nicholas Cruz who was reported to be talking to a former student of the Florida school in the corridor when she heard gunshots. Don't be surprised if this piece of inconvenient evidence disappears from YouTube but it's safe on SpkOut/Bitchute. This may, of course, be a false trail to confuse and discredit "conspiracy theories" of another false flag shooting but those familiar with false flag attacks are accumulating evidence which contradicts the official narrative of a "lone shooter", a troubled student etc. School shootings are not an exclusively 21st century phenomenon. The first cover-up started rather innocently after August 1, 1966, when a likely drug-intoxicated (and/or drug-withdrawing) ex-Marine sharp-shooter named Charles Whitman earned his infamous title as the “Clock Tower Sniper” at the University of Texas (UT) at Austin. How this 1966 shooting morphed into a false flag pattern is alluded to in William Cooper's book, Behold a Pale Horse. 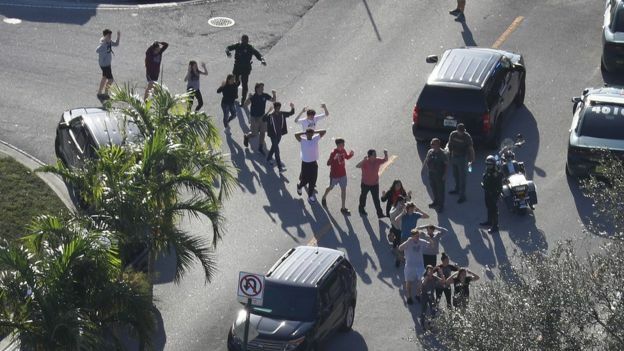 Events like the Florida school shooting are seldom as portrayed and there are always deeper agendas at play. Fear is a primary weapon of control and domesticates us like cattle. The most potent fear is fear of death. Daily Pickings is a blog on issues and events related to the work of the Critical Thinking project and invariably references videos, articles, books and academic papers. Accumulation of these materials adds to the "Critical Thinking reference library". We welcome comments and interaction on Daily Pickings via Comments for which you need to be logged in as a User. Critical Thinking is a collaborative, educational project relying on contributions from diverse sources. "How did they know it was Nikolas Cruz?"